iPad stands: You really do need one. Some are happy with the Smart Cover, which is fine for typing and movie watching, but not much else. 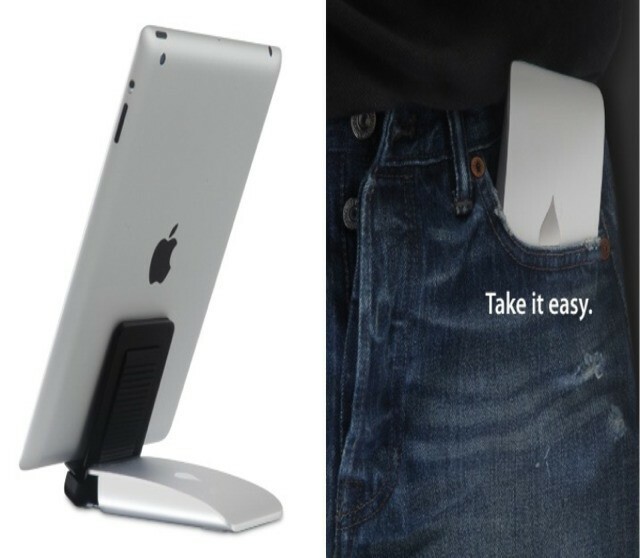 And the really smart folks use the PadPivot, which is still my go-to do-everything stand (I’m using one right now). But if what you want is a sturdy-looking stand for an iPad, whether in portrait or landscape orientations, and whether its in a case or out, then the Slider looks to be worth a look. It’s handsome, at least. Forgive my lack of enthusiasm: between the Smart Cover and the PadPivot all my standing needs are taken care of, from iPhone through iPad mini to heavy iPad 3. It even works for the Kindle. That’s not to say I’m not interested in the Slider, and I do like the clever, portable design. The name comes from the fact that the iPad-grabbing guts slide out like a drawer. Just adjust the angle and drop in the iPad. The fact that it had a long foot that extends back behind the iPad should keep it stable even when stabbing at the screen in portrait. The only trouble I foresee is the same as is suffered by the PadPivot and all other small “wheelbase” stands: it doesn’t deal with soft sofas and beds very well. The workaround is to whip off the Smart Cover and put it underneath to make a stand for the stand. Want one? This ten-ounce aluminum box will cost you a steep $50. Still, if it’s as useful and portable as it seems to be, that’s a bargain: the PadPivot is $40 and I’d buy another in a second if I lost this one.